The worst affected area of the 7.8-magnitude earthquake which hit south-western Pakistan on Tuesday is the dust-strewn town of Mashkel, located just a few kilometres from the Iranian border in the province of Balochistan. Mostly made up of narrow streets, date trees and mud houses, the paramilitary Frontier Corps have a strong presence here as they do in the rest of the province. And it was the Frontier Corps which found itself at the forefront of the violent tremors which flattened much of the town. Lieutenant Colonel Mohammed Arif is the officer in charge of the area, and saw his headquarters collapse before his eyes. "My residence is on a small hill. From there, I saw the shockwave ripping through the town and destroying houses with it." "It was a terrible sight which I can never forget." Officials estimate that about 80% of the houses in the Mashkel area collapsed - either partially or completely - in the quake. Army helicopters have been delivering tents from the provincial capital, Quetta. But we saw family after family sitting amid the ruins of their mud-brick houses under open skies with no shelter. 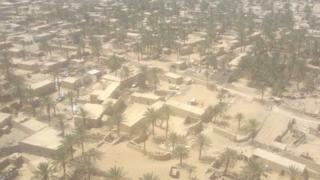 Mashkel social worker Lareef Baloch says that most houses in the town are uninhabitable. "The structures still standing are dangerous because they have cracks in them," he told the BBC. "We see army helicopters flying in and out of town, but we haven't received any tents, blankets, medicines or food." The relief operation has been hampered by the remoteness of the affected area. The road journey from Quetta to Mashkel is long and dangerous. Since Tuesday, small aftershocks have continued to hit the area. One survivor told the BBC that he was traumatised by the experience and now has difficulty sleeping at night. The Pakistani army says it has tried its best in the rescue and relief effort. But an army spokesman told the BBC that people of the area will need help from national and international aid groups in the rehabilitation and reconstruction process in the weeks ahead. It could be that ties on the ground will also play a role in providing help to quake victims. Residents of Mashkel have close ties with ethnic Balochs in Iran's Sistan province. Many people have families and relatives on both sides of the border. The town's economy depends on oil smuggling from Iran and the annual date harvest. The BBC saw several vehicles with Iranian registration plates being used to transport people on sandy tracks. When the earthquake struck this week, many people preferred to take their injured across the border to the city of Zahidan in Sistan province. The Iranian authorities were quick to relax border movements to facilitate the relief effort. The road journey from Mashkel to Zahidan takes a few hours, compared with the 15 to 18 hours it takes to reach Balochistan's capital, Quetta. So far, one of the few Islamic charities that has managed to reach the remote town is Jamaat-ud-Dawa. The group, considered close the Pakistani army, is led by Hafiz Saeed, the founder of the banned jihadist outfit, Lashkar-e-Taiba.